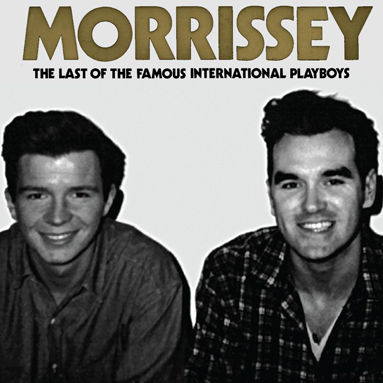 Last month, Morrissey announced that David Bowie put the kibosh on the sleeve of his “Last of the Famous International Playboys” reissue, on which Moz had hoped to use a “previously unseen private photograph” of himself with Bowie taken in 1992. Seems one-hit-wonder and Internet meme kingpin Rick Astley is more willing — or just lacks the power to stop it. 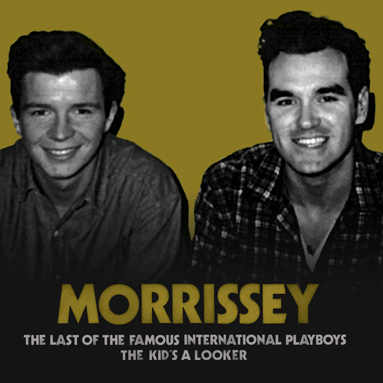 Tonight, Morrissey, through quasi-official fansite True To You, debuted the artwork for the upcoming reissues of his 1991 album Kill Uncle and the aforementioned single, the latter of which features a widely circulated snapshot of Moz and the “Never Gonna Give You Up” crooner backstage at BBC’s “Top of the Pops,” where the two appeared following the February 1989 release of their “The Last of the Famous International Playboys” and “Hold Me In Your Arms” singles, respectively. 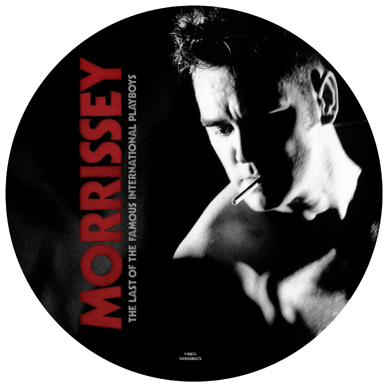 Below, you can see the new sleeves for Kill Uncle and the CD, digital and 7-inch formats of the “Last of the Famous” single, all of which are due to be released by EMI on April 8 in the U.K.
What is he thinking? He’s lost his taste in artwork/design in his old age I guess. And the f**king with the tracklists of his reissues by omitting original tracks (ie: ‘Viva Hate’/’Maladjusted’) is so bizarre. Either he wants the original album releases to have more value, or he’s not concerned with soiling his legacy with tacky sleeves. 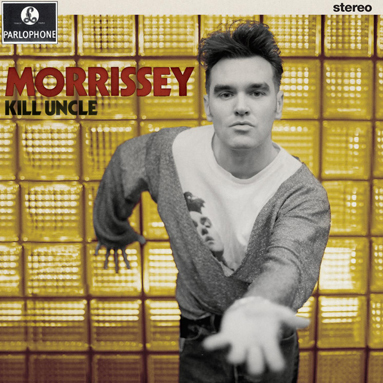 “Kill Uncle” is probably Morrissey’s best sleeve design. Not sure what he’s hoping to accomplish with the faux-vintage redesign. Hmm, I love the original artwork for Kill Uncle. And I agree, the original album track listing should not be tampered with. Adding bonus tracks at the end would have been better. You can always count on Rick Astley to help you out. He is never going to let you down. Is that a cigarette in his mouth!? I’m offended! How dare he promote drug abuse, cancer, and child labor in the tobacco fields. I’ll never appear on his talk show, again! I really don’t have a problem with the way Morrissey has reissued his stuff. I like it being mixed up a bit, and I like that they have new/different cover art. Most people buying these probably have the originals in one format or another anyways. why not just use a picture of the Kray twins? Bowie was probably thinking that Morrissey would have canceled using the pic for the reissue at the last minute anyway…so Bowie one-upped Morrissey!